Click picture to play video – opens in new window. Psaltery played by Andy Casserley, with Ian Pittaway on voice and gittern, playing together as The Night Watch. There comes a ship a sailing is a traditional German nativity carol which accumulated verses through the late medieval, renaissance and early baroque periods. The first two verses are from a manuscript dated 1470-80, now in the Royal Library, Berlin; the remaining verses are from Jan Suderman, Gesange (Song), 1626; and the melody is that given for it in Andernach Gesangbuch (Andernach Songbook), Köln, 1608. The English verses from the original German are by Ian Pittaway. The psaltery first appeared in Europe in the 11th century and consists of a wooden resonating box with a varied number of wire strings stretched across it. Historically, wire strings were made of brass, iron, silver or gold. 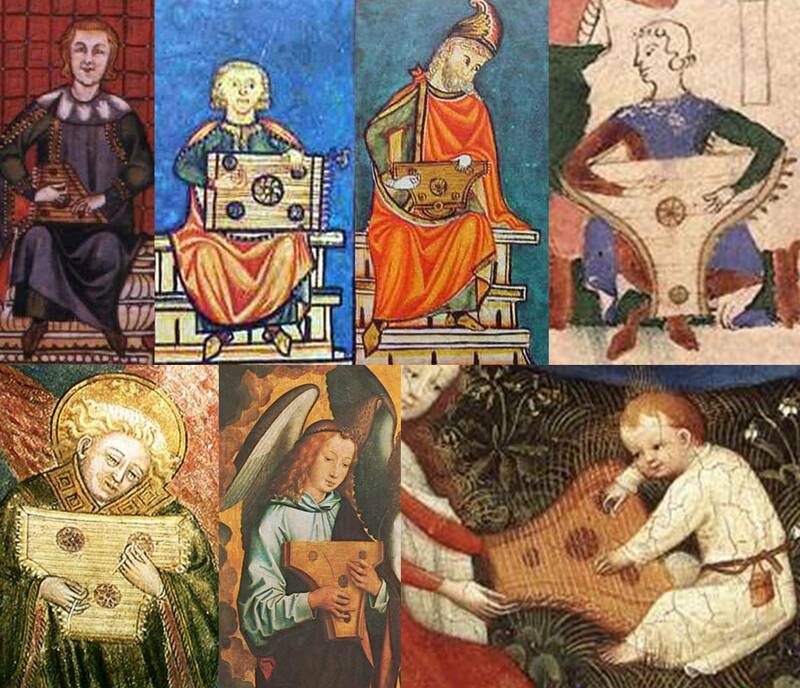 Iconography shows a variety of psaltery stringing practices, strung singly or in double or triple courses to strengthen and embolden the sound. It’s not possible to say whether double and triple strings were in unisons or octaves, but there is arguably a very strong indication in a later work. In his Harmonie universelle, 1635, French Jesuit priest and music theorist Marin Mersenne wrote about the psalterion. In the sometimes confusing nomenclature of early instruments, the psalterion was not a psaltery, but the name for a nearly triangular harp in classical Greece and, by the time Mersenne was writing, a hammer dulcimer (which is unrelated to the modern Appalachian or lap dulcimer). In the middle ages, the dulcimer was less common than the psaltery, reaching the height of its popularity in the 14th century. The dulcimer/psalterion and the psaltery are similar in more than name: they share such a similar structure that it would be true to call a dulcimer a modified psaltery, to be played with small hammers of “iron, or of brass, or such other material as may be preferred” rather than quills, and usually with a central bridge or bridges to divide the vibrating length of each string, thus creating two or more different notes on one course. Mersenne was clearly a fan of the psalterion, writing 1,000 words about it, including its structure, stringing, tuning, temperament, playing techniques, and tablature. Mersenne’s work is so detailed and potentially important for the psaltery that it is worth quoting him directly. 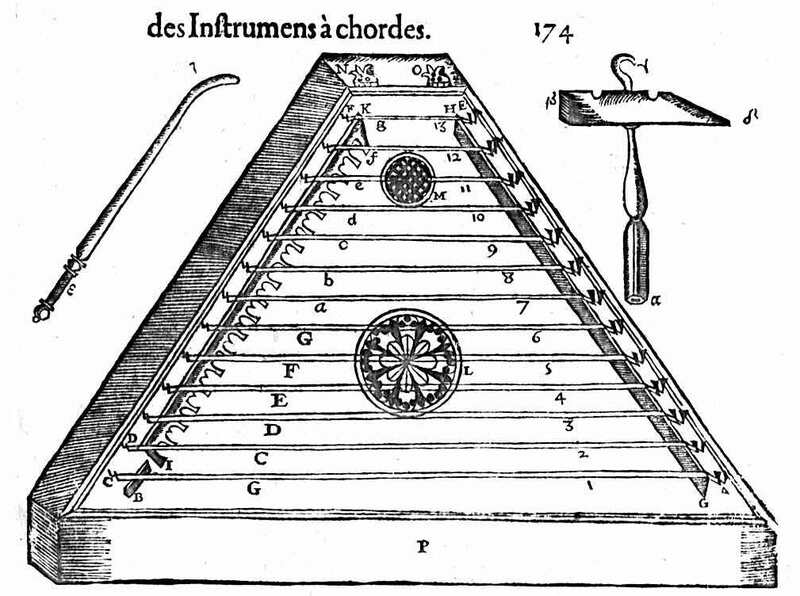 The psalterion or hammer dulcimer, as portrayed in Marin Mersenne’s Harmonie universelle, 1635. “… this figure [see right] represents that which is used now, on which are put thirteen sets of strings, of which each has two strings at the unison or at the Octave, to which one could add others at the fifth, and at the fifteenth to augment the harmony.” Could the unison, octave and double-octave psalterion stringing be a continuance of earlier medieval psaltery practice? There are three pieces of circumstantial evidence which suggest so. The first is that Mersenne states that some psalterion courses were strung “two strings … at the fifth … to augment the harmony.” He doesn’t mention which courses, but this does suggest a very different world of sound to that we’d expect in 1635. A number of courses together tuned in fifths would produce parallel fifths, a medieval practice long since generally considered unmusical. An instrument that produces unisons, parallel octaves, parallel double octaves and parallel fifths is a medieval sound quite unlike anything we are used to now – nor was it the sound of the renaissance or Mersenne’s baroque period. Secondly, referring to his illustration, Mersenne states, “Now this [lowest] string acts as a bourdon”. This is a low string tuned a fourth below the adjacent string rather than diatonic step down as with the rest of the psalterion. Having such a bourdon or drone string was a feature of the medieval harp and vielle (fiddle), harking back to earlier practice. Thirdly, there is another hark back: “the strings may also be played with the quill or the fingers, like the Harpe, Mandore & Cistre [cittern]”, in other words, as well as with hammers, the psalterion may still be played like a psaltery which, by 1635, had fallen into wide disuse for more than a century. Italian painter Tommaso del Mazza, known as the Master of Santa Verdiana, fl. 1377-1392, illustrated a psaltery which is triple-strung throughout being played, apparently, with fingers or nails though, as we shall see below in Girolamo da Santacroce’s 16th century depiction, there may be a slim plectrum between the fingers not visible to the viewer. The evidence is circumstantial but, I would argue, strong. Not only did the psalterion replicate the medieval bourdon of a more-than-diatonic step down; it could have been played like its predecessor, the medieval psaltery; it was shown by Mersenne as a purely diatonic instrument when they had fallen out of favour; and it employed octave stringing which, by 1635, had fallen into disuse on any melody course of any instrument. Octave stringing produces parallel octaves, favoured in the medieval period and continued primarily on the lute during the renaissance, but gradually reduced during the 16th century and increasingly out of favour. Lutenist John Dowland, for example, wrote in 1610 that octave stringing on the melody courses of a lute was “irregular to the rules of Musicke” (in his introduction to his son Robert Dowland’s publication, A Varietie of Lute Lessons). This suggests that, since the psalterion retained medieval practices in several other ways, it retained the octave and fifth stringing of the psaltery. As with all pictures, click for larger view. The bottom row above shows three examples of dulcimers lacking a central bridge, confirming Mersenne’s undivided courses: from De mulieribus claris – On famous women – a 15th century French copy (BnF Français 599) of the work by Florentine author Giovanni Boccaccio, first published in 1374; from the Psalter of Henry VIII, c. 1540-1541; and from the ‘concert tapestry’, c. 1500, now in Cluny Museum. It may be that this was the original form of the psalterion or hammer dulcimer, essentially a hammered psaltery, with central bridges added later. Top right, from a Flemish altarpiece, c. 1490, now in the Museu de Évora, Portugal, the first evidence of a major innovation: two bridges with a string arrangement that has triple courses crossing in two planes, which thereafter became a common feature, clearly distinguishing it organologically from the psaltery. By the time of the beautifully illuminated Cantigas de Santa Maria (Songs of Holy Mary), an Iberian royal songbook of circa 1257-83, various shapes and sizes of psaltery were in evidence – rectangular, trapezoid, and pig snout shaped. The position of players’ hands indicates two hands working together and it is clear there was always mixed practice in plucking style: either plucked with a quill in each hand; a quill in one hand while the other played with flesh or nails; or two hands both playing with flesh or nails. Was this one musical line played by two hands for extra speed and dexterity, or two polyphonic parts being played, or perhaps right hand tune and left hand drone (which may be explained by louder quill playing the tune and quieter flesh or nail playing the bourdon drone, and by the high left hand position s below, top row, second and third images), or a combination of all three? Like so much of medieval music-making, we just don’t know. 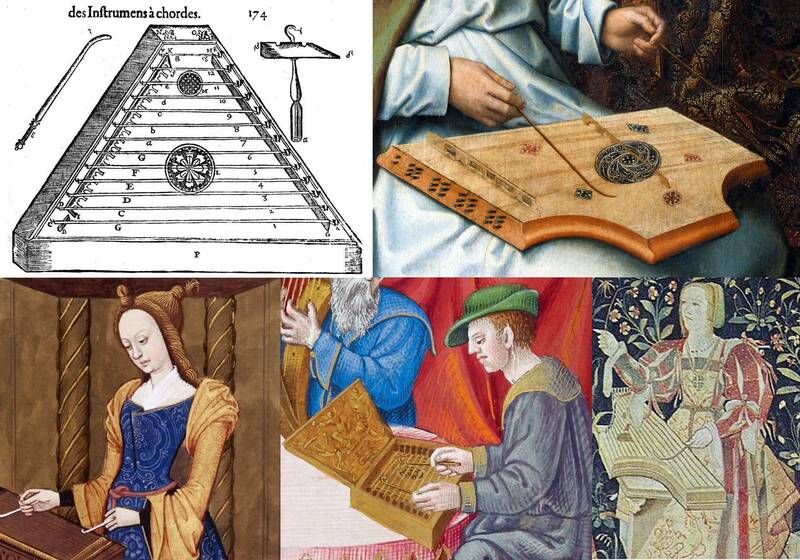 Above we have images of psaltery players showing various combinations of quill and hand playing. Occasionally the psaltery is shown played flat on the lap, but more usually in the upright position shown here. Top left to right: Three images of psalteries from the royally-appointed Iberian songbook, Cantigas de Santa Maria (Songs of Holy Mary), 1257-83, trapezoid, rectangular and pig-snout shaped. On the left of these three, the right hand is playing the upper part, the strings for which are situated nearest the player. On the right of these three, the right hand is again playing the upper part, but here the strings for the upper part are situated furthest away from the player. In the middle rectangular example, it is impossible to tell. The remaining images are of the predominant pig-snout shape: top right, Portugal, 13th or 14th century; bottom row from left: France, 15th century, from a crypt vault; Spain (originally), 1480s, detail from a triptych by Hans Memling; Germany, c. 1410, detail from the anonymous painting, Garden of Eden. The sitting players are all depicted playing in a practically credible way. The standing Hans Memling player (bottom row, second from left) has the psaltery impossibly suspended in mid-air with no visible means of support, a clear case of artistic licence. The French cleric (bottom left) has the curve of the pig-snout supported by his lower arms, a more credible position, but still surely awkward. It is highly likely that standing psaltery players secured their instruments with straps, but artists thought this unsightly – see below. Death playing a psaltery, from the Heidelberger Totentanz, 1488, a rare image of a player with a strap. Standing strapless psaltery players are seen again and again in iconography. 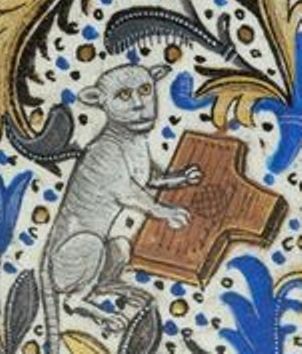 It may be that if one learns to hold and balance the instrument from the beginning then the practicalities of standing and playing, supporting the psaltery only with the arms, are unproblematic, but the iconography suggests otherwise, often showing impossibly suspended instruments with no means of support. 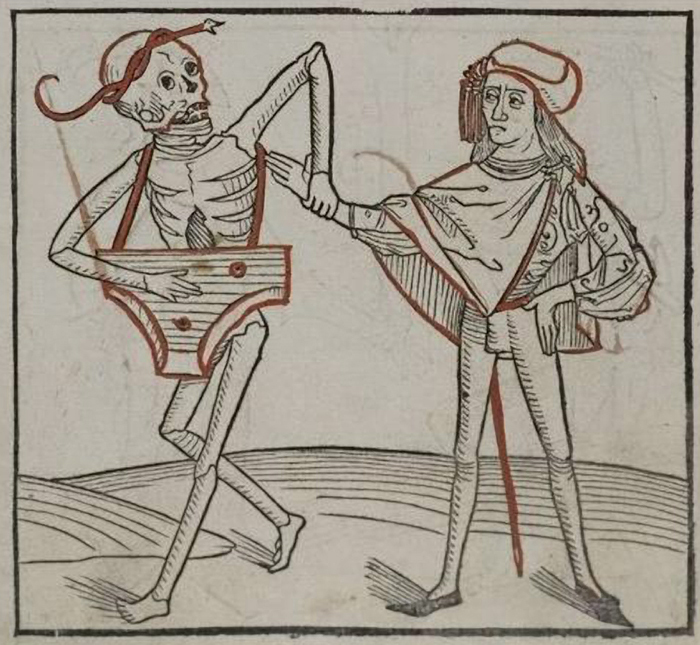 The skeletal player in the Heidelberger Totentanz, a German book of 38 woodcut prints of the dance of death, published in 1488, is one of only a handful of images to show a strap. Whether this is a rare representation of reality or a representation of a rare practice is impossible to know; but the preponderance in iconography of standing or walking harpers with harps floating freely suggests that artists didn’t like depicting straps, considering them a visual distraction. There is no written evidence of the way the psaltery was tuned until the 14th century Berkeley manuscript (see below), but since its nearest neighbour, the harp, was diatonic, and that was in keeping with the music theory of the day, we can be fairly sure the psaltery was also diatonic until the 14th century, that is to say, it had only the natural notes of a scale (the white notes on a piano), no accidentals (sharps or flats, the black notes). Medieval music was in 8 modes, creating different musical moods by using a scale without sharps or flats by starting from and ending on D, E, F or G. These 4 were known as authentic modes. There were also plagal modes, starting on one note (A in the hypodorian mode, for example) but ending on another (D, in this case). 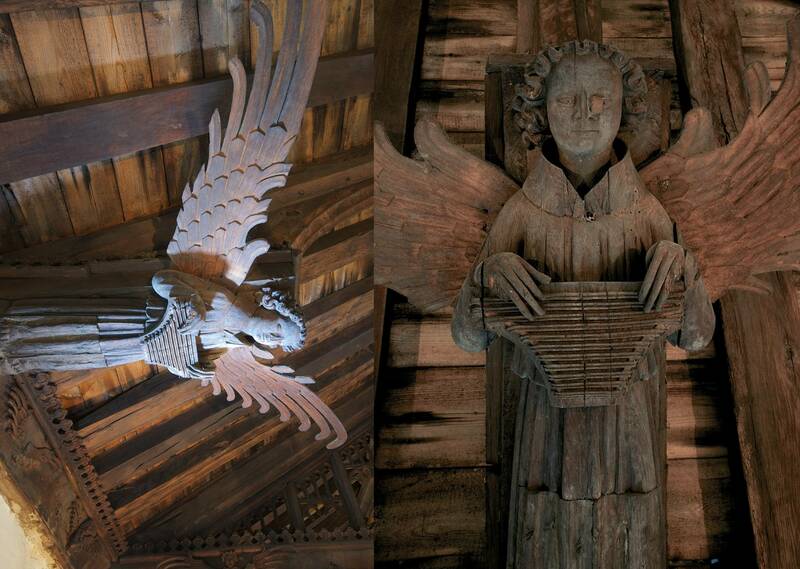 A psaltery-playing roof angel in Saint Nicholas’ Church, King’s Lynn. Pictures used with the kind permission of author Michael Rimmer. From the early 15th century, just a little after The Canterbury Tales, we have an extraordinary and striking example of musical iconography in the roof angels of Saint Nicholas’ Church, King’s Lynn, including a psaltery player and a gittern player. These angels are four and half feet tall, almost life-size figures, looking down impressively on the congregation. See Michael Rimmer’s website for more on roof angels and his book about them. Hans Memling (also Memlinc) was a 15th century German painter who worked in Flanders and bequeathed to us fine representations of musical instruments. In many cases, such as the psaltery, there are no existing examples of the actual instruments, so detailed iconography yields invaluable information. Perhaps the most important of Memling’s paintings for musicians and luthiers is his triptych altarpiece for the Santa María la Real monastery in Nájera, Spain (now in the Koninklijk Museum Voor Schone Kunsten, Antwerp, Belgium), showing six angel singers and ten angel musicians. Painted in the 1480s, its three large extant panels each measure 170 x 230 cm, thereby giving detailed and life-size depictions (left to right in the two panels shown above) of a psaltery, tromba marina, lute, folded trumpet, shawm, straight trumpet, folded trumpet, portative organ, bray harp and vielle (medieval fiddle). The psaltery is painted in great detail, but it has features which appear at first to be odd. 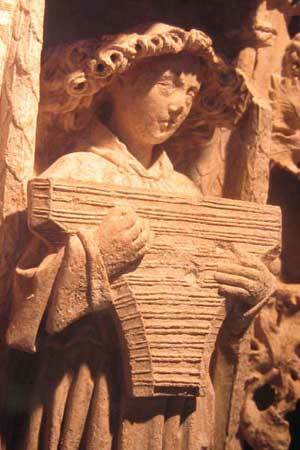 Again we see a psaltery without a strap, unsupported and levitating away from the player’s body. (The tromba marina is also held impossibly aloft to keep it in the viewer’s vision, out of the heavenly clouds below.) A psaltery needs tuning pins on one side and hitch pins on the other for the strings to be held in place, traversing the bridges on both sides. This psaltery has tuning pins on our right but no hitch pins on our left, the strings disappearing behind the instrument on the left side. This psaltery has 61 strings, counting from the left bridge (more from the right bridge – see below), positioned so closely together and so evenly that, if these were double or triple courses, it would be impossible to tell visually where one course ends and the next begins, but this cannot represent 61 independent diatonic pitches, as that would make a technically impossible range of 8 octaves and a sixth, so another tuning solution is necessary. An artist who is so careful to paint details such as the psaltery’s four finely decorated roses is, I suggest, to be trusted unless there are good grounds for not doing so, so let’s work on the basis that Memling was faithful to reality. The levitating instrument is an artistic convention, since we see it in paintings from the middle ages right through to the baroque period. Let’s also assume that this was an unusually designed instrument with hitch pins on the back (it’s a bit of a waste of string and the pins might catch on your clothes, but it’s not impossible as long as you don’t want to play the psaltery on an entirely flat surface, which is never shown in iconography) or possibly an arrangement with a comb on the back on which to hook loop-end strings. So if the playing position is artistic license and a back with string pins or a comb is feasible, then potentially so is the stringing. If we allow for double-stringing of courses this gives 30 pitches plus 1 single string, a diatonic range of 4 octaves and a third or less if, as happened on some diatonic harps, there was both a B and a Bb string in each octave. In the 15th century, English composer John Dunstaple (or Dunstable) pitched his polyphonic voices wide apart, a new practice which was hugely influential, known in Europe as “the English countenance”, marking the beginning of what was to be a post-medieval, renaissance style of music. Could it be that Memling painted a new style of psaltery, modified with a hugely expanded pitch range to play in “the English countenance”? Perhaps. Certainty is impossible. It may even be that this was a radical, new, fully chromatic psaltery. If so, this would still give a single-strung range of 5 chromatic octaves exactly; or a double-strung range of 2 octaves and an augmented fourth (which is admittedly an odd range). Perhaps, as a result of the creation of the fully chromatic harpsichord family some time between c. 1350s and 1397 – a new keyboard family derived from the psaltery (more of which below) – some inventive psaltery makers were trying to keep pace, resulting in this hugely expanded number of strings. Due to the gaps in the evidence, we can only make educated guesses. There is another feature, unique to this psaltery in iconography, though not necessarily in historical reality, about which we can only make educated guesses. Not only are there 61 strings counting from the left bridge, there is an arc of 22 points from left to right across the longer strings, attached to each of which is another string coming from the right hand bridge (from our perspective, left hand for the player), giving a shorter vibrating length and therefore a higher pitch than each adjacent string. If we assume the shorter strings are the same diameter as each adjacent string and at the same tension, just as a thought experiment, then they cannot be octave courses, since to raise the pitch of a string by an octave we halve the vibrating length, and each string length is reduced by less than half here. This needs an explanation. It is therefore logical to be reminded of Mersenne’s statement that some psalterion/dulcimer courses were strung “two strings … at the fifth … to augment the harmony.” Are we seeing an example of the psaltery’s courses tuned in fifths, as Mersenne’s psalterion was? If so, it seems an awkward way to do it when different gauge strings could more easily achieve fifths. Perhaps the practicality lies in the soundboard string-holders for these shorter strings, giving the facility to play each of these courses with or without the fifth, depending on where along the string length the course is plucked. This would add versatility to the instrument, as fifths could then be added only when appropriate to the music or to gain a particular effect, and avoided at other times. It raises the intriguing question of whether psaltery courses were always, often or sometimes tuned in fifths on lower strings, but without the facility for omitting the extra fifths, as on this instrument. Since we cannot know the comparative gauges of the shorter strings, they may be tuned in octaves to the adjacent strings, so the same principle could apply to playing or avoiding octaves. To summarise and suggest a solution. The psaltery painted by Memling is shown in such careful detail that it is arguably credible, giving us information not otherwise available. If strung in 31 double courses, it would have a diatonic range of 4 octaves and a third, or less if there were both B and Bb strings; or a fully chromatic range of 2 octaves and an augmented fourth, which is a very strange range for an instrument. So this leads us to the possibility of believing Memling’s literal representation of the stringing: the reason it is not possible to tell where one putative double or triple course ends and the next begins is because it is strung singly, until we reach the lowest 22 courses. This gives a single-strung range (counting from the left bridge) of 5 chromatic octaves exactly – a far more sensible range than 2 octaves and an augmented fourth. This leaves the bottom 22 courses, doubled with shorter strings. If a maker and musician wanted to be so modern as to have a fully chromatic instrument then it seems anachronistic for him to employ courses tuned in old-fashioned parallel fifths, so they are more likely to be octaves, still used on other instruments, selectively played or avoided according to where the player plucks along the string length. There is evidence from the previous century for another option for the modified psaltery tuning: neither diatonic nor fully chromatic, but diatonic plus those notes most needed for the music of the period. This is precisely what we find in the Berkeley theory manuscript, probably written by 14th century Parisian music teacher Johannes Vaillant, who died in 1361. His manuscript is a compendium of music theory, including drawings and tunings for the vielle (medieval fiddle), gittern, harp and psaltery. We can see that, in order to retain the unbroken sequence of double course, double course (or possibly triple course, single course) followed by shorter single course accidental, the two octaves are not identical: the B flats and b naturals appear in different relationships in the sequence in the different octaves, and therefore only the upper octave has a C sharp. The Berkeley author was intending to illustrate common practice. It is impossible to know for sure whether the psaltery the author had in mind really was strung in this exact fashion, with large gaps between each pair of courses within which there was a shorter single course for accidentals. Such an arrangement would certainly have been a sensory aid for the player, to give placement. But it may only have been drawn as such for teaching purposes, as a helpful visual tool. Observing that such an arrangement appears nowhere else in iconography could arguably be decisive, were it not for the fact that the meticulously detailed and therefore credible Memling psaltery, with its part-way stringing, is also unique in iconography. Pictorial exceptionalism is not proof of non-existence, nor does it prove actual uniqueness in historical reality. 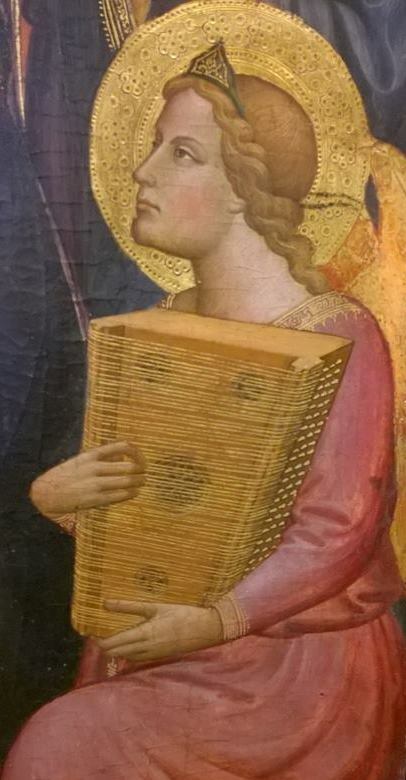 There is a detail on the double-strung psaltery painted by Italian artist Sano di Pietro in his Assumption of the Virgin, 1448-52, which shows even spacing between courses for higher pitches and uneven spacing on the lower pitches, with larger gaps between some courses. Since the gaps within courses are largely consistent, this is theoretically less likely to be a result of inaccurate painting. Whether it is an intimation of diatonic tuning at the top with some lower-pitched accidentals, indicated by differential spacing as per Berkeley, can only be speculative, as is the overall accuracy of his depictions of instruments. Sano di Pietro, Assumption of the Virgin, 1448-52. The psaltery he painted is double-strung throughout, except for a single bottom course, possibly a bourdon. There is greater spacing between some of the lower courses, perhaps indicative of some accidentals, as in the Berkeley manuscript. Extreme caution should be exercised with this particular painter, though, as the details on the other instruments are not true to life. The fingerholes on the shawms on our right, for example, are in places that would render them unplayable. 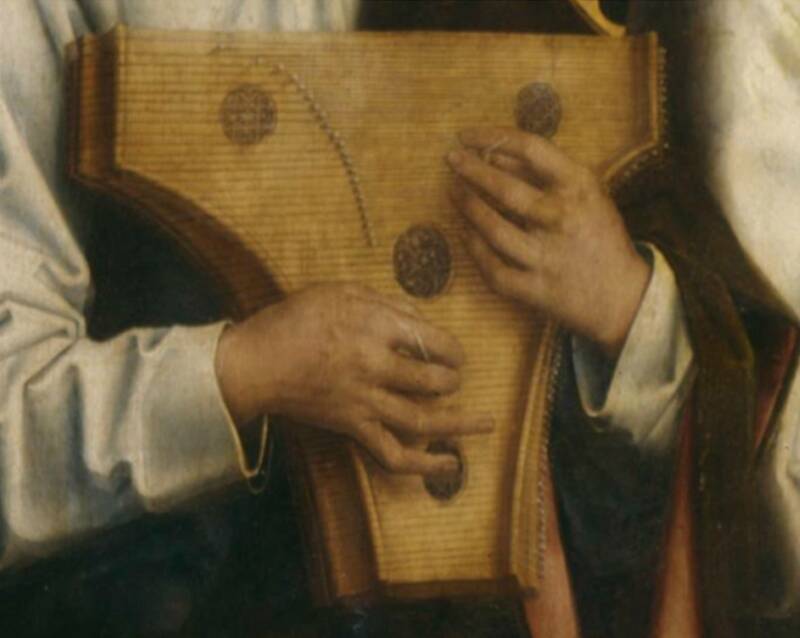 It is nevertheless notable that this psaltery appears to have a comb arrangement for affixing strings on the side: there is no reason in principle why the Memling psaltery, discussed above, should not have this arrangement on the back. So it seems that, in the 13th and 14th centuries, some psalteries may have had uneven string spacing for placement; and others had shorter single strings, but not always for the same purpose: shorter either for accidentals, as Berkeley shows, or for tuning courses an octave or a fifth apart with the option of playing only the fundamental, as Memling implies. We’re in the realm of the possible, with insufficient written evidence to corroborate conclusively. Berkeley shows and Memling implies different solutions to musical developments towards the end of the medieval period and into the renaissance. With the arrival of the renaissance in the 15th century, medieval modes continued to be used, as well as music with fixed sharps or flats, not defined precisely by modes, which would have presented no problem for the psaltery, with just a little retuning required. Complex use of musica ficta, with accidentals used only in some parts of the music, would have posed more of a problem. Purely diatonic psaltery players may have used the same method as diatonic harpers, which was to retune the changed note in one octave but not the other, to allow both to be used in the same piece of music, but this would have meant swapping octaves for some phrases or part-phrases and could not have been a long-term solution to enable the psaltery to keep pace with changing musical styles. Psaltery from the Hours of Bonaparte Ghislieri or Albani Hours, Bologna, c. 1500 (Yates Thompson MS 29, f. 104v). Due to changing fashions and the limitations of a diatonic instrument in a new chromatic milieu, there is no renaissance music written specifically for the psaltery, and scant evidence of it being played after c. 1500. There are, however, two intriguing late depictions indicating renaissance development of the psaltery in its final days. On the right is an image from the Hours of Bonaparte Ghislieri or Albani Hours, Bologna, c. 1500. Unlike the closely-spaced stringing of the Memling psaltery, here we see a regular pattern of 3 widely-spaced strings followed by a gap. The units of 3 strings appear to be internally evenly spaced. There are earlier Italian depictions of psalteries with strings in groups of 3 with much closer spacing, indicating courses of 3 strings, and this image may likewise indicate a triple course strung in 3 unisons or, as indicated by Mersenne, fundamental and 2 at the octave, or fundamental and fifth (1+2 or 2+1), or fundamental-fifth-octave. However, if we take the wider string spacing here as representative of reality – and if is the key word here – it may indicate groups of 3 single diatonic courses followed by gaps to aid the player’s placement, akin to the gaps shown on the Berkeley psaltery. If we add to a diatonic octave the 2 most often used medieval accidentals, Bb and F#, being the 2 accidentals added to otherwise diatonic medieval organs, then 9 strings, 3 groups of 3, makes an octave group: c-d-e / f-f#-g / a-bb-b. This is speculation, but what is clear is that the instrument has 2 internal bridges as on the dulcimer/psalterion, allowing the possibility of 2 pitches per course, assuming the vibrating string length between outer bridges on both sides is the same, or 3 pitches per course if they are not. Such an arrangement would make the placement of internal bridges critical for correct tuning. Another possibility is that the psaltery is only played between the two internal bridges. The effect of vibrations through the internal bridges would be to drive the soundboard, creating a more resonant instrument. The lower part of the instrument with the shortest strings has an additional central bridge. My supposition is that the maker wanted pitches at this point in the sequence which were too high for wire string technology, so the work-around was a central internal bridge to raise the pitch: the effect of halving the vibrating string length on each course with a central bridge is to create pitches an octave higher than the full vibrating string length. It is also notable that this musician is playing hands free, not needing to support his instrument since it is tied on over his shoulders, which must have been practical common practice for standing players, regardless of whether iconography typically shows straps or ties. A painting by Venetian artist Girolamo da Santacroce in the first half of the 16th century suggests a further technical development. 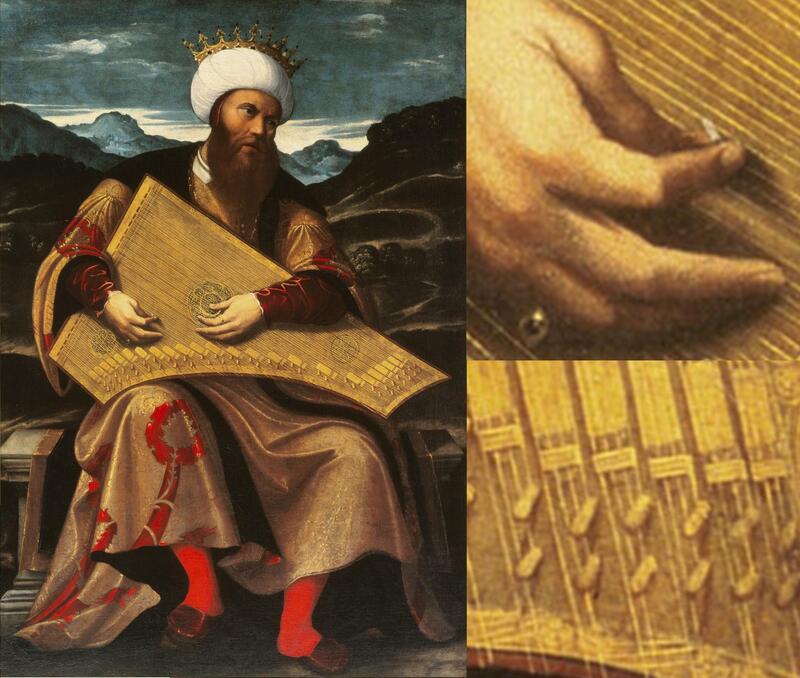 Girolamo has King David playing a large psaltery with a plectrum in the right hand and with fingertips or nails on the left. The instrument has clearly evolved to suit renaissance music, but precisely what it represents is open to interpretation. King David playing the psaltery, painted in the first half of the 16th century by Venetian artist Girolamo da Santacroce. The instrument is apparently strung in courses of 2 strings. Looking at the inset bottom right, we see that the pair of strings on the left reach as far as the edge of the psaltery, which acts as the nut, and the pair on the right are attached to dowels on the soundboard which have the effect of shortening the string length. My supposition is therefore that one of these string pairs are accidentals a semitone apart from the adjacent pair. The logical choice, for reasons that will soon become clear, would be that the shorter strings are natural and the longer strings flats, so that the group of 4 strings together are (working from our left to right) 2 x e flat / 2 x e natural, 2 x d flat / 2 x d natural, and so on. This would have an effect on playing technique: thinking of each group of 4 strings as a unit, a downstroke gives the natural note, an upstroke gives the flat. A fully chromatic instrument in a meantone temperament where the string length cannot be changed has potential tuning problems when playing a range of pieces, since an f sharp and a g flat in unequal temperament are not the same note. I suspect the short blocks of wood are for fretting notes sharp, for pressing onto the strings to give all the correct notes for sharp keys. These two devices together would provide for flat keys when courses are played open, and for sharp keys when courses are fretted. It’s an intriguing instrument, and appears to show an attempt to chromaticise the instrument before it died out altogether, but its precise function is speculation and there are clearly other interpretations. The Sforza Hours (BL Add. MS 34294), c. 1490 and 1517-20, is richly illustrated by Italian miniaturist Giovan Pietro Birago and Flemish illuminator Gerard Horenbout. This unusually shaped psaltery in Sforza is too large to be played in the usual forward-facing position, and is clearly shown plucked by fingers rather than a quill. The modified psalteries shown by the Berkeley manuscript before 1361, Memling in the 1480s, the Hours of Bonaparte Ghislieri in c. 1500 and Girolamo in the first half of the 16th century, suggest different solutions to the same problem: how can the diatonic psaltery become non-diatonic to keep pace with changing musical styles? Contemporaneous with all four of these solutions was a fifth, far more radical solution, which proved to be a significant influence on music-making until the present day. 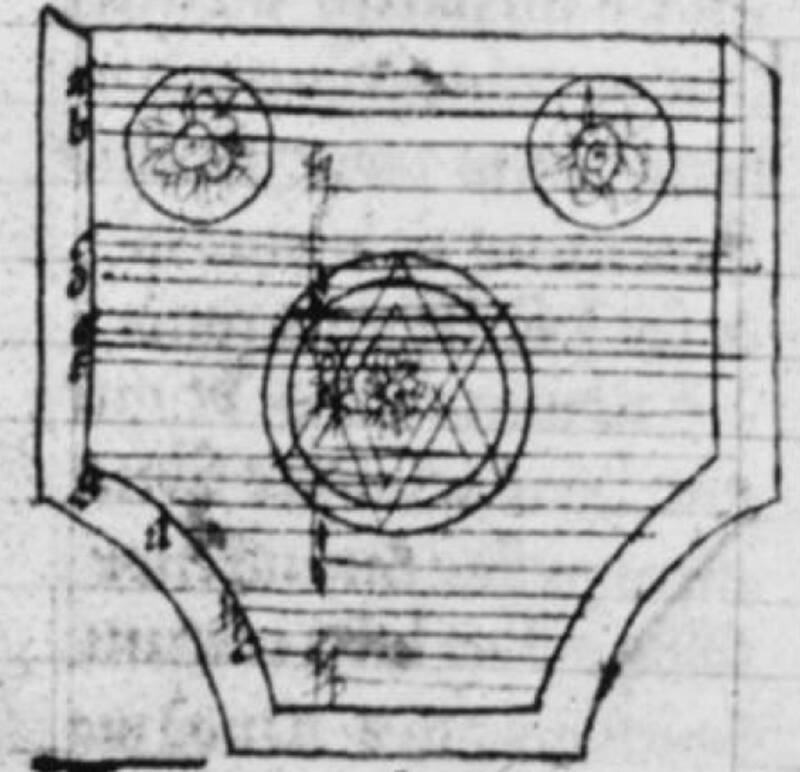 Above, perhaps the oldest image of a member of the harpsichord family in the Berkeley Theory Manuscript, before 1361. It appears to be a psaltery with a keyboard, incompletely-drawn. The order of notes is certainly the correct way round for a keyboard. 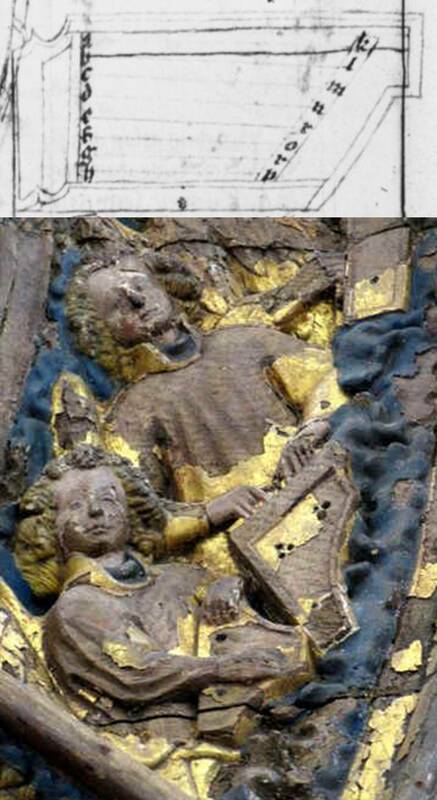 Below, the earliest complete image, a clavicembalum, shown next to a psaltery which was half its inspiration, the other half being the organ. From a circle of angel musicians on an altarpiece from Minden, Lower Saxony, Germany, now in the Bodemuseum at Berlin, dated to 1425. This image has not been reversed: the clavicembalum really is represented with notes low to high from right to left. If you search on the internet for ‘psaltery’ it is almost impossible to fight your way past the plethora of words and videos for the bowed psaltery. This is a simple modern instrument, first patented in 1925 as the violin zither by the Clemens Neuber Company in Germany. The simpler and now familiar triangular form was popularised as a simple musical learning aid for children by Walter Mittman, a primary school teacher in Westphalia, after World War II. Apart from the borrowed name, it is unrelated to the medieval psaltery. One genuine evolution of the psaltery is, as we have seen, the hammer dulcimer. Another is the harpsichord. The earliest reference may be a drawing in the aforementioned Berkeley manuscript, before 1361. The author drew an instrument which strongly suggests a psaltery with a keyboard (see right), though the keyboard is only partially drawn. On a copy of the manuscript made in 1503-04 at the Abbey of Saint Bavo in Ghent, Belgium, the keyboard is clearly shown. The first indisputable reference to the evolution of the psaltery into the harpsichord family is the clavicembalum in a letter of 1397. In that year, Hermann Poll travelled from his home country of Germany to the University of Pavia, Italy, to study medicine. On his way he met Lodovico Lambertacci, who wrote to his son-in-law that Poll was “a very ingenious man and inventor of an instrument that he calls the clavicembalum.” It is essentially a mechanical psaltery: take the idea of a quill plucking a wire, then add a jack action and wooden keys as on an organ to activate the jacks, and you have the family of clavicembalum, harpsichord, virginal and spinet, essentially the same instrument in different shapes and sizes. It is no coincidence, then, that since the maker was German, the earliest extant image is, too. An altarpiece from Minden, Lower Saxony, dated 1425, shows a psaltery player and a clavicembalum player next to each other within a circle of angels (see right). We have seen the evolution from the diatonic psaltery to the addition of accidentals by additional courses, or by fretting, or by fully chromatic stringing probably shown by Memling, making it essentially a plucked harpsichord. All these devices were attempts to keep pace with the creation of the first keyboard psaltery, the clavicembalum, which led ultimately to one of the most important instruments of the 19th and 20th centuries. Bartolomeo Cristofori of Padua, Italy, was an expert maker of harpsichords, employed as Keeper of the Instruments for Ferdinando de’ Medici, Grand Prince of Tuscany. In 1700, Cristofori invented what he called “un cimbalo di cipresso di piano e forte”, a keyboard of cypress with soft and loud. By attaching hammers instead of quills to the keys – a mechanical return to the principle of the psalterion/dulcimer – he had invented an instrument with a wide gradation of dynamic range, giving the player control over volume not possible in the harpsichord family. By 1850 steel string technology was available instead of iron wire, and over time the name of his instrument was abbreviated to pianoforte, fortepiano, and eventually piano. With thanks to Gill Page for permission to use her photograph of the Tommaso del Mazza painting, now in the Musée de Petit Palais, Avignon; to Paul Baker for being a sounding board and prodding my thinking on the Memling psaltery; to Arnold den Teuling of Assen, Netherlands, for permission to use his photograph of the Minden altarpiece – for more on this image, see Arnold den Teuling’s website – and to the Bodemuseum, Berlin, for their unrestricted photography policy. I wonder if the psaltery is in any way related to the (far, far later) autoharp. They certainly are similarly shaped and held in a similar manner. Hello, Panth. That’s an interesting question. I don’t really know about the history of the autoharp, but the same principle of strings across a frame played on the lap facing forward does suggest an evolutionary link. The autoharp is a development of the zither, it’s origins are German from the mid 19th century. The zither is essentially a psaltery, sometimes with strings in courses of two. The original autoharps were table top instruments, we know this as old ones have have metal feet on the underside of the soundbox. In modern times, C + W players hold them against the chest. I presume that the Finnish ‘Kantele’ is also related to the psaltery. Indeed, Tony. The kantele is a beautiful instrument, played in Finland (kantele or kannel), Karelia (kantele or kandele), Lithuania (kankle), Estonia (kannel), and Latvia (kokle or kuokle). Like most instruments, the modern kantele has more strings than its predecessors and, like many instruments, there are many claims for its ancient origins that rely more on conjecture than hard evidence. The oldest extant kanteles are dated to between the 12th and 14th century, and it doesn’t get a mention in writing until the 16th century. I don’t know the exact lineage and relationship to its musical relatives in central and southern Europe – such issues are rarely simple and involve best guesses from incomplete data – but the principle is just the same as the psaltery and clearly they’re from the same family.